Angela and Luigi are lifelong friends, who decided to transform their careers, by starting a business named after an old style of fishing boats of Anzio, the “manaidi”, that cures and preserves fish using traditional methods. Anzio is a fishing town in Lazio that lies between Ostia and Sabaudia, that starts it’s fishing season around May and finishes it around September. Thanks to the profound depth of the surrounding waters, there is a strong fish culture and using salt as a method of preserving fish, has ancient roots. Already in Roman times the octopus of Anzio was consider the best in the empire, has the roman writer Plinio once said. Since the 700 women spun and dyed the sails and nets, children ground salt, men went to sea, and the elderly contributed by telling stories of storms and turtles, dolphins and full moons. These traditions and synergetic way of life was interrupted in the fifties, with the arrival of the canning industry and a pause in the ancient dialogue between the water and the town. With the birth of Manaide in 2013, the lengthy hiatus ends; the tradition is reformed and the story resumes where it left off. The two friends found themselves at dead ends in their jobs; Angela Capobianco was in the catering industry and Luigi Crescenzi was a manager in charge of the transformation of plastics. They had been friends for as long as they can remember, but it is only in 2013 that their paths converged into a kitchen-workshop which they built from scratch to start their new enterprise. Few principles guided them: freshness, love for the land, tradition, biodiversity and sustainability. Manaide was the name chosen for their business, in tribute of the boat used for fishing the traditional breeds of oily fish that were found in the local waters. 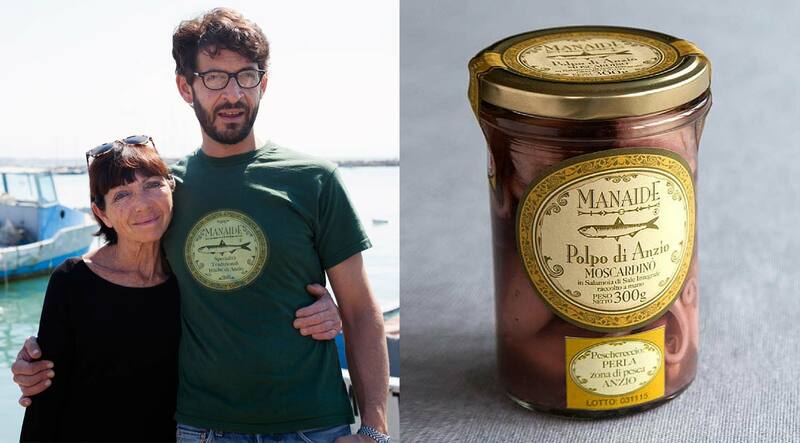 Manaide, apart of the name, it restored the ancient artisan tradition of canned fish of Anzio. Let’s start with the vital ingredient: fish sardines, anchovies, bonito, octopus and squid, sea snails, clams caught within the waters surrounding the town, with regulations in place to ensure the conservation of seasonal species for the following year and to protect biodiversity in the waters. Fishermen in Anzio are best described as sprinters in a relay: their fishing trips are brief, as their catch arrives to the market still alive, so the boats have no refrigeration systems on board. When the fish arrive on land, they are immediately and skillfully transformed in the kitchens of Manaide and the fish never see the inside of a fridge or freezer- this is the epitome of freshness. The preservation stage of the fish is the most delicate phase of the process. Angela and Luigi combine each fish species with the most suitable method using coarse sea salt, worked in by hand and extra virgin olive oil, which has the right balance and delicate aroma so as not to cover the taste of the fish. The laboratory is fluid: it does not work to its own rhythm, but follows that of the sea – this is true sustainability. On each jar – from octopus, to cockles (a variety found only in this area of ​​Lazio and in a small part of France), from the belly of bonito to anchovies – the name of the vessel and the batch of fish is written to ensure traceability. As with the ancient vessel form after which it was named, Manaide became the protector of this section of the sea: Angela and Luigi protect its existence, telling stories of this place through the greatness of the food they bring to the table.